It is my pleasure to introduce another intern we have been lucky enough to work with this summer. Beimnet Demelash has been a terrific colleague–it is difficult for us to believe that she is still in high school! Without further ado, here are Beimnet’s thoughts about her summer with us at SAM. Nobody really knows what happens on the 5th floor of the museum. Everyone just thinks the art is placed there for them to look at and don’t understand how much work it takes for everything to go smoothly in the museum. All of the hard work is done on the 5th floor, whether it’s planning exhibitions, sending out invitations, planning events, or raising money for the museum. The staff on the 5th floor does it ALL. 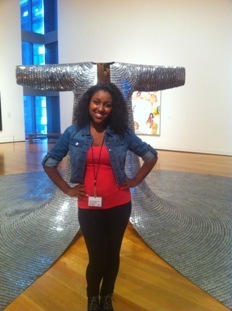 This summer I have had the pleasure of working as a YWCA intern for the Seattle Art Museum. I have worked on a lot of different things that I feel will prepare me for any office job, things like entering data into different databases, filing, filling out paperwork by hand, mailings and much more. Some of these things were challenging at first, but after asking the right questions I got the hang of it. My favorite part of my internship was giving a tour of my three favorite pieces of art in the museum. My three choices were “A Country Home”, “Man and Mouse”, and “Some/One”. I was very scared at first, but once I got in front of the art I knew exactly what I was going to say. Another thing that made everything go smoothly during the tour was the fact that everyone was very involved in the conversation. I want to say Thank you to my supervisors and the staff for helping me step out of my comfort zone and talk about the things I loved about those three pieces of art. I thought my biggest challenge as an intern this summer was going to be adapting to the office environment, but everyone is very nice and helpful and best of all they all know that it’s ok to have fun while working. As a 15 year old that made everything easy to learn and more fun. I love being able to laugh and have fun during work. I think that the goofing off helped bring me closer to everyone. I couldn’t imagine being anywhere else this summer. Thanks again to everyone on the 5th floor for making this an amazing internship!